A PR disaster all about employee trust, and how individuals control the collective reputation. 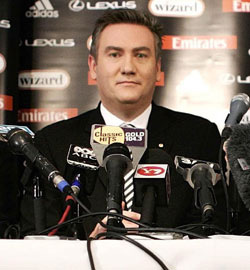 AFL club Collingwood today faces not just an embarrassing PR disaster, but surely a serious HR issue too. After the club CEO Ed Maguire publicly flamed one young player (Heath Shaw) for involvement in a drink driving car crash, then dismissed claims that another player (Alan Didak) was involved, it’s been revealed Didak fled the DUI car!! Before a media conference, both players insisted to the club and leadership group that Didak was not involved, despite eye-witness reports saying otherwise. This goes to the heart of organisational and HR culture. In a toe-curlingly embarrassing moment, club President Maguire threw out Didak’s poss involvement, inferring the player would be implicated in the Kennedy assasination next! Didak is no stranger to dodgy drink related car escapades, either. And the club previously lost a sponsor over another drunken player episode. So how does Collingwood regain the reputational lost ground now? By letting the players ‘play on’ – the club laughably spins this as a punishment – or by showing its public(s), that it’s HR policy is really intolerant of behaviour – drunkenness, feeing the scene of an accident and lying within the ‘company’ – and metes out a credible deterrent? The club’s decision has just been announced: Collingwood has suspended Alan Didak and Heath Shaw for the remainder of the 2008 season, including finals, for lying about a drink-drive accident.